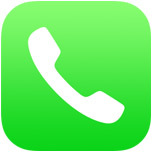 We all have received phone calls from numbers we don’t recognize, and even when they show up on the iPhone caller ID and provide an area code or region they’re coming from that call can still be a mystery. Like many others, I’ve gotten in the habit of just ignoring phone calls from numbers I don’t recognize, letting Voice Mail sort out if the caller is actually something important or just a telemarketer. But what if they don’t leave a message? 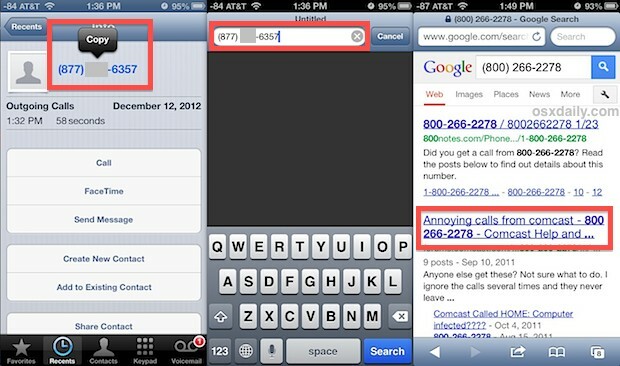 In the screenshot below you can see an example of how this works, with the second result revealing the caller to be Comcast. Yes, the search result has been swapped out with Comcast because the original caller probably wants some privacy, but you get the idea. This obviously won’t work for calls that come through as “Blocked” due to the *67 prefix, and it obviously won’t work on “Unknown Number” calls either, but for anything else, it’s pretty handy. suggesting people google something is not a pro-tip worthy of an article on a website like OSX Daily. really. Fair enough, if you know of another way to get quick phone call info like this let us know! LOL JK, I don’t think there are any other ways. Would be nice if Apple provided a way to search just by tapping the number, though it would probably use Siri which also uses Google, so you are searching the web regardless to find this type of public data. This has to be the most pathetic “tip” ever published. But your comment on the other hand, so very useful. There is a neat method if you are in front of your computer with an app that I use called phone amego. I have my iphone paired with the mac. As soon as a call comes in, phone amego searches firstly within contacts and then if it doesn’t find it, it does an online search (which you can specify) and comes 90% of the time, it comes up with a name. Works great. Am not affiliated with them. It also does a search on outbound calls and displays it much like a growl notification, all transparent. App called White Pages has reverse numbers. Also Number Guru. White Pages app or Reverse phone lookup website is more of a tip than what the article is saying.. which is copying a number and pasting it to google is NOT a tip. This guy Paul sounds like he’s a 85 year old just entering the realm of technology. Sadly, the scammers and marketers now have easy caller ID “spoofing” technology. They use a number that’s nearby to your number so you might think it’s a legit caller. If you block that caller it really has no impact, since it’s very unlikely that the scam caller will use that number on the next attempt.